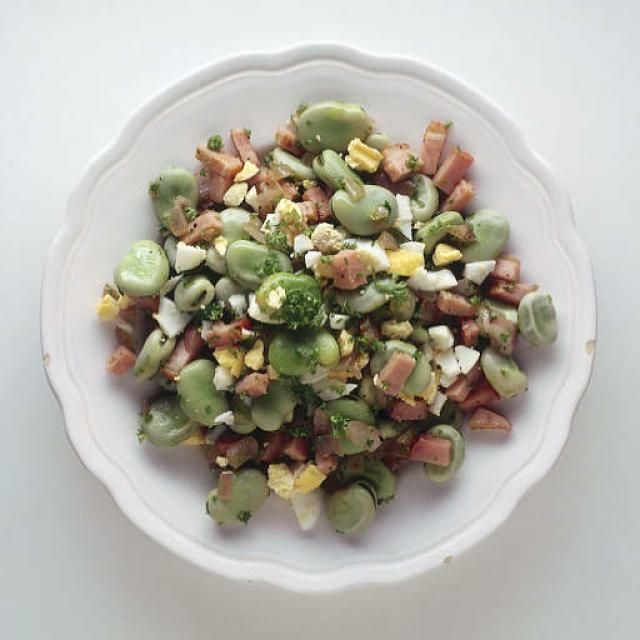 This classic dish from Ronda - the enchanting Andalusian town that enamored the poet Rilke, Orson Welles, and the Bloomsbury writers, among many others- is a marvellous use of fresh broad beans. Once you shell the beans, you need to boil them to remove their tough outer skin. The process is time-consuming, but I find it a therapeutic break - a time to think quietly. You can, of course, enlist someone to help you to make the time pass more quickly. If you instead use dried broad beans, I recommend buying the split ones available in Middle Eastern markets; they are already skinned and they cook faster than whole dried beans. Fill a saucepan with water and bring to a boil. add the salt and the beans and boil for 15 minutes if using fresh beans, or 30 minutes if using dried beans. Drain, reserving 1 cup of the cooking water. Peel the fresh beans to uncover their sparkling green color. In a sauté pan, heat the olive oil over medium heat. Add the onion and garlic and sauté, stirring frequently, for about 10 minutes, or until the onion is soft and lightly caramelized. Add the Jamon and sauté for 2 minutes, or until its fat turns shiny. Add the beans and the reserved cooking liquid, cover, decrease the heat to medium-low, and cook for 15 minutes, or until the beans are tender. Cut each egg lengthwise into 8 wedges, or chop the eggs coarsely. Add the eggs to the beans and mix well. Serve hot, garnished with the parsley.